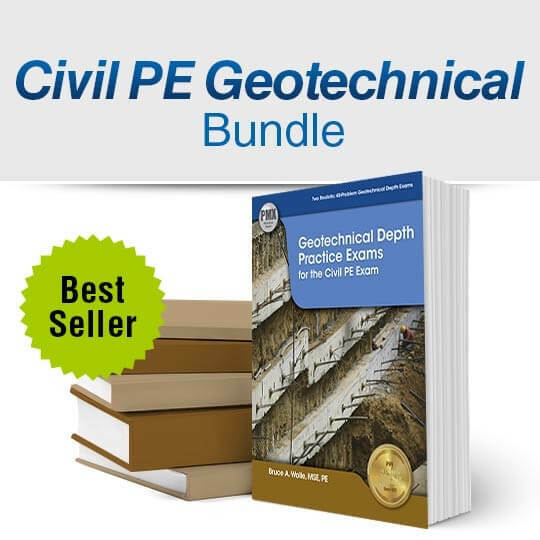 Civil PE Geotechnical Bundle (GEO3): This is the Civil PE Geotechnical Bundle that PPI has put together for you. It includes all the books you need for this depth section of your exam. 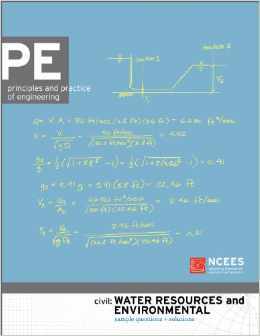 Civil PE Professional Engineer Exam: This book is aimed at students who are studying for the Civil PE Geotechnical module Depth Exam. You will get 40 multiple choice questions in the afternoon session and 4 hours to answer them. You have 6 minutes per question. Some questions, you can complete in less than 6 minutes. Some other questions may take more than 6 minutes. This book covers all the subject matter with a plethora of illustrative examples. 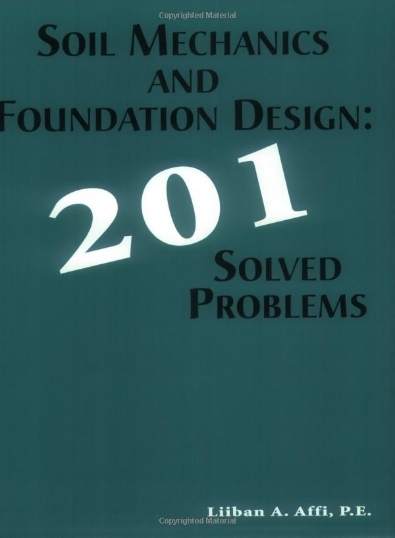 Soil Mechanics and Foundation Design: 201 Solved Problems: Complete review and practice for the geotechnical section of the civil PE exam and the California GE exam. 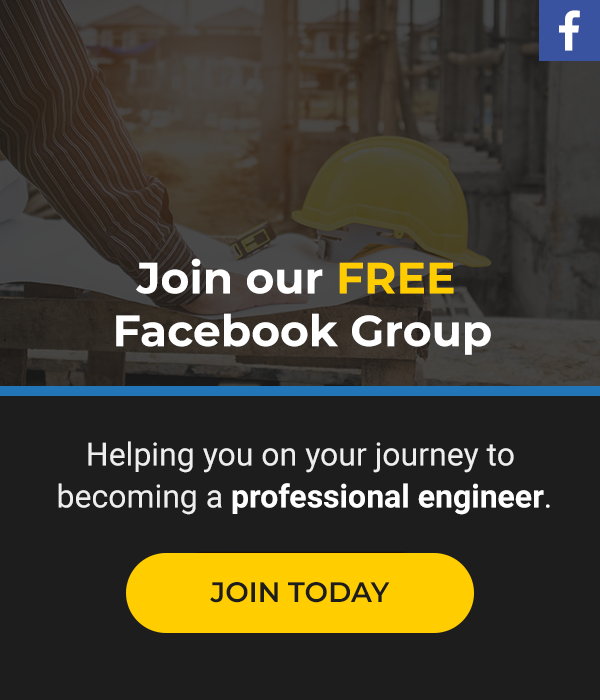 Learn to solve geotechnical problems in the most efficient manner. 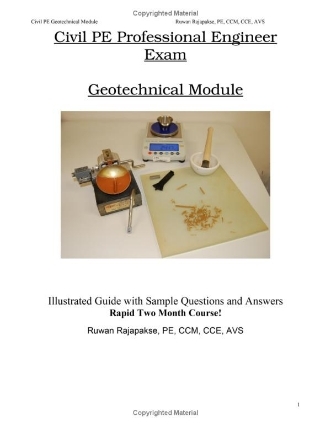 PE Civil: Geotechnical: This book contains 40 questions from the Civil morning specifications and 40 questions from geotechnical afternoon section. This is developed by the NCEES organization and provides the most real-life exam that you can purchase. 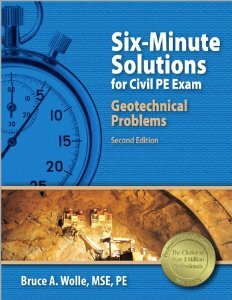 Six-Minute Solutions for Civil PE Exam: Geotechnical topics make up about 20% of the morning exam and appear in all civil PE exam depth modules, so this book will serve you extremely well. Topics covered include subsurface exploration and sampling, engineering properties of soils, soil mechanics analysis, shallow foundations, deep foundations, earth-retaining structures, and seismic engineering. These are typically harder for the breadth section type problems but will help with the depth section. 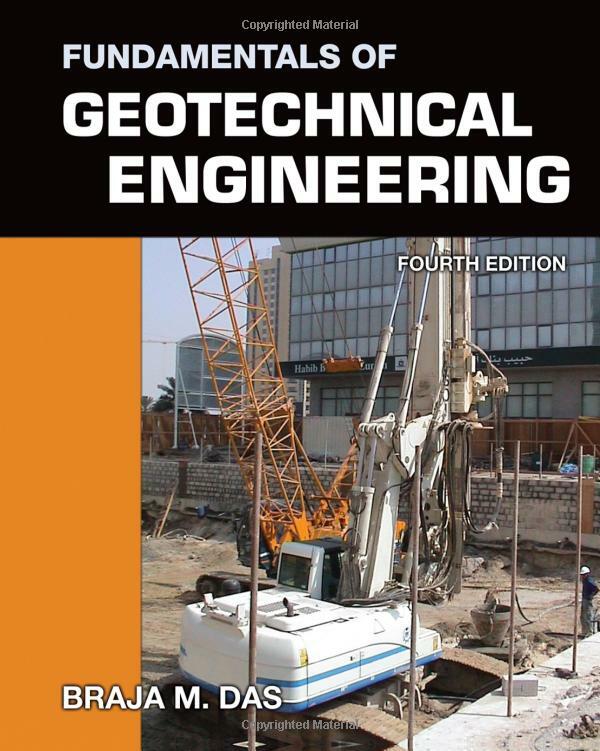 Geotechnical Engineering: Designed to complement the McGraw-Hill Civil Engineering PE Exam Guide: Breadth and Depth, this subject specific “depth” guide provides comprehensive coverage of the subject mattter applicants will face in the afternoon portion of the PE exam. Each book, authored by an expert in the field, will feature example problems along with power study techniques for peak performance. 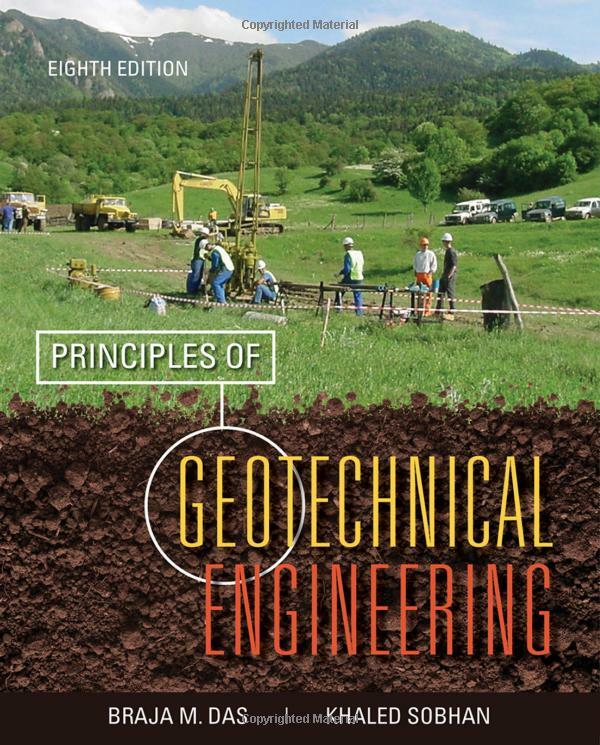 Principles of Geotechnical Engineering: Intended as an introductory text in soil mechanics, the eighth edition of Das, PRINCIPLES OF GEOTECHNICAL ENGINEERING offers an overview of soil properties and mechanics together with coverage of field practices and basic engineering procedure. Background information needed to support study in later design-oriented courses or in professional practice is provided through a wealth of comprehensive discussions, detailed explanations, and more figures and worked out problems than any other text in the market. Fundamentals of Geotechnical Engineering: This is a concise combination of the essential components of Braja Das’ market leading texts, Principles of Geotechnical Engineering and Principles of Foundation Engineering. The text includes the fundamental concepts of soil mechanics as well as foundation engineering without becoming cluttered with excessive details and alternatives. FUNDAMENTALS features a wealth of worked out examples, as well as figures to help students with theory and problem solving skills. Das maintains the careful balance of current research and practical field applications that has made his books leaders in this area. Principles of Foundation Engineering: Originally published in the fall of 1983, Braja M. Das’ Seventh Edition of PRINCIPLES OF FOUNDATION ENGINEERING continues to maintain the careful balance of current research and practical field applications that has made it the leading text in foundation engineering courses. 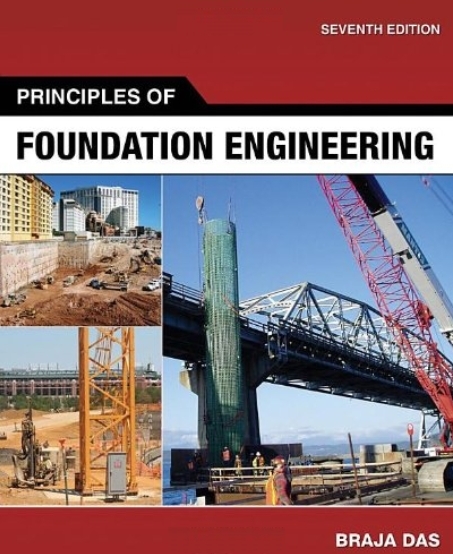 Featuring a wealth of worked-out examples and figures that help students with theory and problem-solving skills, the book introduces civil engineering students to the fundamental concepts and application of foundation analysis design. Throughout, Das emphasizes the judgment needed to properly apply the theories and analysis to the evaluation of soils and foundation design as well as the need for field experience. 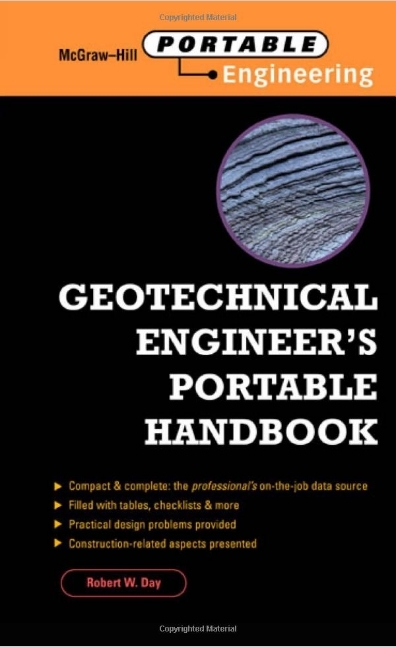 Geotechnical Engineer’s Portable Handbook: One-volume library of instant geotechnical and foundation data now for the first time ever, geotechnical, foundation, and civil engineers…geologists…architects, planners, and construction managers can quickly find information they must refer to every working day, in one compact source. Edited by Robert W. Day, the time -and effort-saving Geotechnical Engineer’s Portable Handbook gives you field exploration guidelines and lab procedures. The second edition just came out and these will link to that. 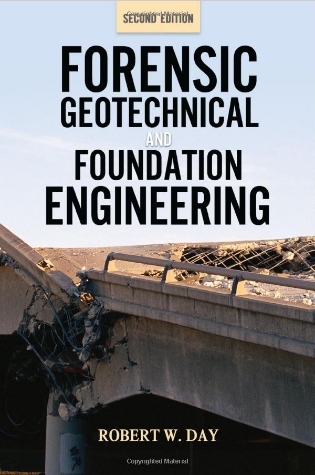 Forensic Geotechnical and Foundation Engineering, Second Edition: Fully revised and packed with current case studies, Forensic Geotechnical and Foundation Engineering, Second Edition provides a step-by-step approach to conducting a professional forensic geotechnical and foundation investigation. This authoritative resource explains how to investigate damage, deterioration, and collapse in a structure, determine what caused the damage, develop repair recommendations, diagnose cracks, prepare files and reports, and avoid civil liability. 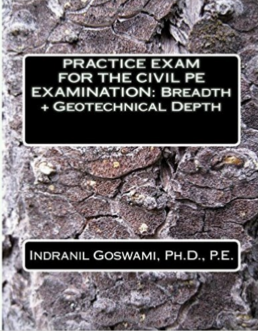 Essential Civil PE Exam Notebook, Breadth and Depth (Review of Geotechnical Theory and Sample Exam Problems): This notebook has been developed by the author during their own preparation for civil PE exam in 2010. From their perspective, proper organization of material was the most significant aspect of preparation for the test. This notebook is designed to provide you with information necessary to pass the examination in the format of easily explained theory followed by many sample problems and solutions you could expect during your examination. The exam problems follow format of the actual exam. They also provide you with empty graph pages after each section for additional notes. 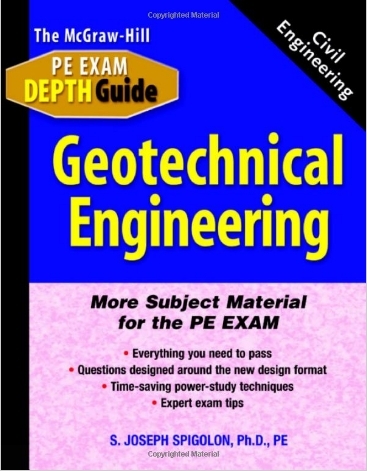 I personally used this manual and found it very beneficial for preparing for the geotechnical depth exam. 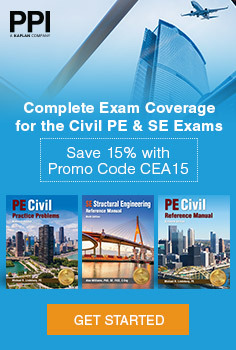 Practice Exam for the Civil PE Examination: Plus Geotechnical Depth: This full-length practice exam contains 40 breadth (AM) questions + 40 depth (PM) questions in the area of GEOTECHNICAL ENGINEERING. These practice exams were developed after the syllabus went through reorganization in January 2015 and are therefore consistent with those changes. This is the second printing where errors and typos have been fixed. Goswami has written a few books. This one is geared toward the goetechnical depth exam. His breadth books are pretty good for the level of difficulty of the problems, so I assume that this would be pretty similar. It’s cheap too so you can’t go wrong with this.